Situated amongst the high-rises, just one block from the famous "Avenida del Libertador" in the most elegant and vibrant part of Palermo, you will find our luxurious penthouse apartment. Enjoy breathtaking views by day of the River Plate and by night the stunning bright city lights. Entertain by grilling native meats and vegetables Argentine-style on your personal barbeque! Relax, as you slow-cook them using local wood and charcoal while sipping a Malbec chosen from the neighborhood wine shop. Enhance your experience with local tango on the radio, the CD you just bought from the street band, or by plugging in your Ipod. Thinking of friends at home? Step into the office, open wide the glass doors and dial them direct (free of charge) or send them an email describing the sailboat race you"re observing while a gentle breeze caresses you. Welcome to the property that convinced me to make my first purchase outside the United States. floor, there is a half bath and separate office where, upon request, you can put a third, single bed. Please note that we also rent a one bedroom apartment in the same building. We also want you to enjoy all the modern technical conveniences of home. The penthouse has high-speed wireless Internet with an IP phone enabling you to call and receive calls from the states, Canada, and Western Europe for free. There are two local GSM cell phones, a local telephone with free calls, a flat-screen television with 80 cable channels, and a Dvd player with surround-sound stereo. As for location, you are in the heart of Palermo and can"t be better situated. Step out of the building and walk to the incredible zoo, Botanical Gardens, Evita museum, Rosedal (infinite number of rose bush varietals,) Hipodromo (horse races,) Campo Argentino de Polo (polo fields,) and Club de los Amigos (tennis, swimming, and other sports.) You"re also within blocks of Buenos Aires best museums: the MALBA and the Museum Nacional de Bellas Artes, Recoleta, Palermo Soho as well as dozens of Argentina"s finest restaurants, boutiques, and gyms. Click Here for Updated Calendar. Be sure to let us know that you found us on Travel Rental Network! Rates vary depending on the travel Season. Please inquire for exact pricing during your desired stay. 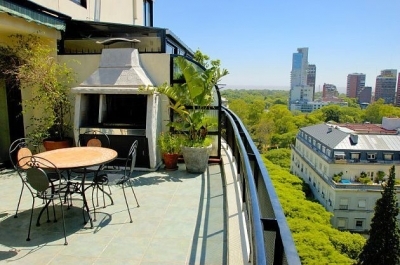 Located in the heart of and most vibrant part of Palermo, Buenos Aires, and on the beach in Pinamar (3 hours away) I offer you four of my personal residences for rent. These are luxury apartments with detail to style, comfort, and our personal touches. In original Palermo, we are blocks from the parks, museums, zoo, polo fields, sports facilities and surrounded by the best restaurants, boutiques, and gyms.